Lillian Smith and "Jim the Kid" are Satisfied it is. NEW YORK, Aug. 12--[Chronicle dispatch--Special to TRIBUNE.] 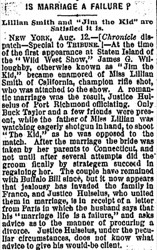 --At the time of the first appearance at Staten Island of the "Wild West Show," James G. Willoughby, otherwise known as "Jim the Kid," became enamored of Miss Lillian Smith of California, champion rifle shot, who was attached to the show. A romantic marriage was the result, Justice Hulselus of Port Richmond officiating. Only Buck Taylor and a few friends were present, while the father of Miss Lillian was watching eagerly shotgun in hand, to shoot "The Kid," as he was opposed to the match. After the marriage the bride was taken by her parents to Connecticut, and not until after several attempts did the groom finally by strategem succeed in regaining her. 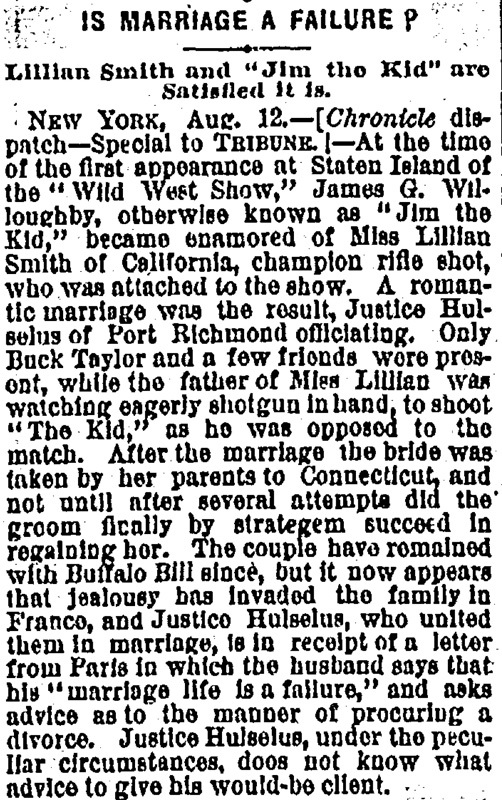 The couple have remained with Buffalo Bill since, but it now appears that jealousy has invaded the family in France, and Justice Hulselus, who united them in marriage, is in receipt of a letter from Paris in which the husband says that his "marriage life is a failure," and asks advice as to the manner of procuring a divorce. Justice Hulselus, under the peculiar circumstances, does not know what advice to give his would-be client.